Available from Blackstone Audio’s Downpour site. Some can be heard here on our Mark Time Radio History page. See the Audiofile Magazine Review. Brian Price, the writing half of the “Loose Wheels” team, calls this collection of short pieces “a unique hybrid of humor, music, character and performance” based on our shared love for Lord Buckley, Beat poetry and the prose-poem form. 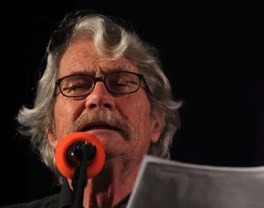 The opening reading with improv sax behind me comes from an intimate evening in 2002 at the Yellow House in West Plains MO. Most of the rest of the performances were pieces Brian wrote as encores to the CONvergence and Minicon Science Fiction convention programs in (or near) Minneapolis. An opportunity to present part two of “Cart 437” came at 2016’s Hear Now Festival. 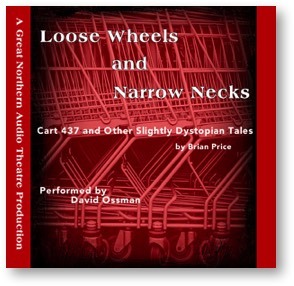 Join me (and my fellow musicians and performers) in a thoughtfully poetic, yet tragically comic, tour of the 21st Century on Great Northern Audio’s just released Loose Wheels & Narrow Necks.